Langdon’s Grill is a full service bar, grill and restaurant featuring fresh, affordable, regional cuisine served in a casual and friendly atmosphere. Seasonal menu changes keep us new and exciting. Breakfast, Lunch, and Dinner are served along with regular specials. Fantastic Happy Hour specials are served from 3 to 6pm Monday thru Saturday and all day on Sunday. Every Tuesday from 4pm to close get a ½ rack of tender slow-roasted baby back ribs brushed with BBQ sauce and served with loaded mashed potatoes, molasses baked beans and a cup of house-made soup or salad. Jazz at the Grill features jazz music and is complemented by the juiciest prime-rib you’ve ever had served with salad and dessert every Friday starting at 4pm. We’re conveniently located between Wilsonville, Canby, and Aurora in Oregon, so come dine with us at Langdon’s Grill! Rebecca started her professional career with the Boston based vocal jazz group The Ritz in 1986. They performed at the 1987 Montreal Jazz Festival as well as jazz clubs throughout the country, and recorded a CD entitled The Ritz for the Denon Columbia label. Rebecca moved to Portland, Oregon in 1990 and started the vocal jazz group Euphoria, performing throughout the Northwest for over a decade, most notably opening for Mel Torme’ in 1993 at the Hult Center in Eugene, Oregon. In 2013, she embarked on a solo career and quickly became a favorite jazz vocalist with local musicians in the Portland area. Rebecca scats with the ease and swiftness reminiscent of Ella, Anita O’Day and Mel Torme’, and her tone and sense of style is matched by her respect for the lyrics and dignified delivery. Rebecca Hardiman’s CD Release Party! 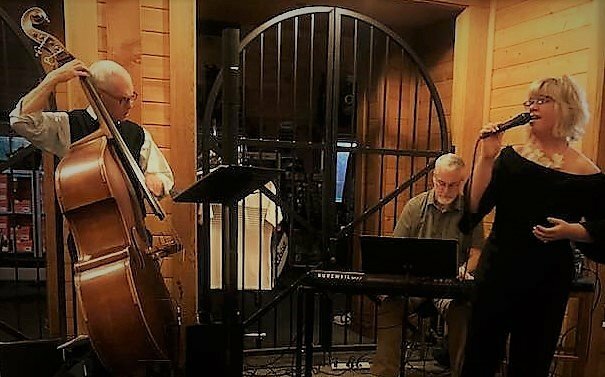 Join us for a special evening which will debut the latest recording from The Rebecca Hardiman Quintet – LIVE, along with our popular Friday night dinner options! Join our community. You’ll be glad you did!